Maryse Robicheaux LeJeune polished off a truly excellent cinnamon roll and lifted her coffee to wash it down. 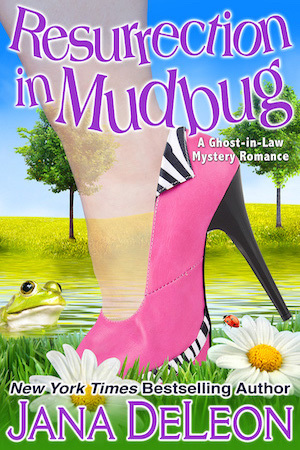 She had just filled her mouth with the hot liquid when Helena Henry walked through the wall of the Mudbug Café and sat in the booth across from her. Before her mind could even process what she saw, her body reacted and she spit the coffee across the table, where it passed right through the smiling ghost. “Are you all right?” the waitress asked. Maryse waited until the waitress walked away and glanced around the café to ensure that no one was within hearing distance. Then she leaned across the table. Maryse’s mind raced with possibilities that might explain the ghost in front of her, but all of them were horrible. “Is someone going to die?” Maryse asked. Maryse closed her eyes and started counting. Maybe if she counted long enough, she’d open her eyes and Helena would be gone. Maybe if she wished it hard enough, this entire episode could be classified as a temporary mental break that she’d learn to live with. Please God, don’t do this to me. Maryse downed the last of her coffee, wishing it were a shot of whiskey. The peaceful existence she’d enjoyed for the last year was officially over.